What is a palletized unit load? A unit load is the basic storage and transport unit arranged on a modular support or in packaging (box, pallet, container, etc.) to ensure efficient handling. Unit loads are handled at working locations such as a general warehouse, reserve warehouse, picking warehouse with carton flow racks, in-house transport equipment, etc. As a result, in a single installation it is possible to handle one type of unit load or various types. The unit load can be divided into smaller elements that can also be handled. The first logical division results in order preparation units, which are the smallest product units for each item that can be delivered to a customer. In turn, order preparation units can be divided into delivery units, which are groups that consist of sales units that allow for the optimal running of production, distribution, and sales systems. If this unit is not the same as the order preparation unit, it means that there is a wholesaler between the supplier and the retailer. Similarly, this delivery unit can be subdivided into sales units, which are the smallest product units the consumer can buy from a retailer. The following diagram explains how units are divided and subdivided throughout the logistical flows of the product. Loose sales units can also be stored in a warehouse, without the packaging box or container. 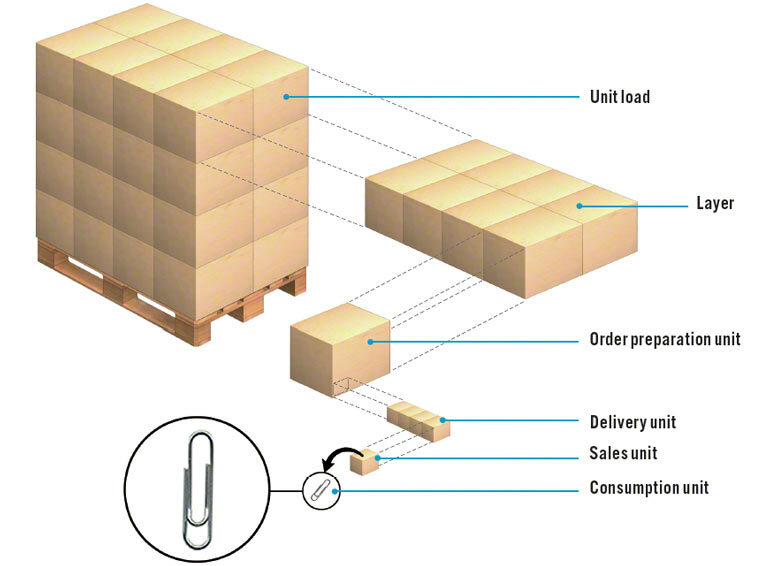 This facilitates what are called picking operations (which involve selecting units of goods to fill an order). Shelving unit with small-sized pigeonholes. If you have any questions, we would be pleased to find the storage solution that is right for you.